The roof-to-wall connection is one of the most important questions on the Windstorm Mitigation Inspection. 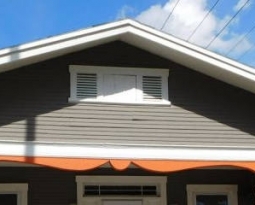 It is basically inquiring as to how your roof is being attached to the rest of your house. In the event of a hurricane, and particularly if one of the openings on your home fails and is blown in, the force of the wind entering your home can equalize the pressure inside and outside your roof. It is at this point that your roof-to-wall connection may be sorely tested. The types of connections that can help a homeowner receive a discount on their insurance include clips, single wrap straps, and double wrap straps. 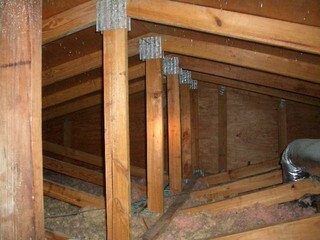 These are all metal connectors that must be connected on every truss or rafter with at least three nails to qualify for a potential discount. There is another criteria; however, that is now also important when evaluating the roof-to-wall connection. 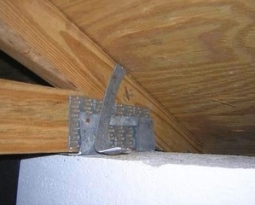 Since 2012, the inspection form issued by Florida’s office of insurance regulation has required every metal connector to be within half an inch of each truss or rafter when it comes out of the wall where it is embedded. 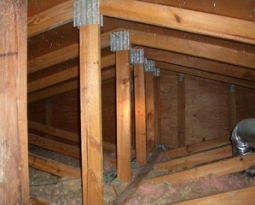 If trusses are rafters have wooden blocking present between the metal connector and the truss or rafter, the distance can be one and a half inches. Anything more than that distance and the metal connector is considered to be misaligned with the truss or rafter, and ineligible for a potential insurance discount. 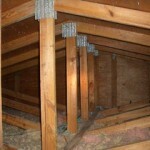 This is because the manufacturer’s specifications for these metal connectors when used as roof-to-wall connection is that they should be installed as close as 1/8 of an inch from each truss or rafter. 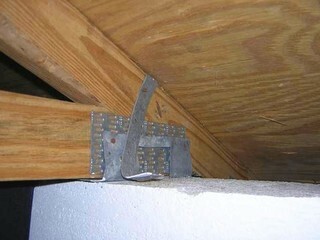 Prior to the current version of the office of insurance regulation’s inspection form, the maximum distance between the metal connectors’ emergence from the wall and the truss or rafter was not mentioned on the form. It was thus possible to obtain a potential insurance discount even if the metal connectors were installed in a manner that was far outside the manufacturer’s specifications for their use. For example, when a clip or a strap sticks up out of the wall and then has been hammered over for 4 or 5 inches prior to being nailed to each truss, no one is quite sure how they will perform when tested in a catastrophic hurricane situation. A professional engineer could theoretically try to calculate how they would behave if called upon to hold the roof down, but this would not be an application that was tested by the manufacturer or recommended for use. Nor is it a situation that an insurance company should feel comfortable with, nor obligated to provide a discount for. If I Have Misaligned Connectors, What Can I Do? If a properly-conducted windstorm inspection establishes and documents the presence of one or more misaligned connections, that home is not eligible for a discount related to the roof-to-wall connections at that moment, but it does show photographs of what needs to be upgraded. On the positive side, homeowners who are made aware of this misalignment can take concrete steps to repair or replace these metal connectors. This is often easier to do when a new roof is being put on or the roof deck replaced; however, many people undertake remediation work as soon as they are made aware of the misalignment of their roof-to-wall connections. There are many acceptable methods for retrofitting misaligned connectors that remediation companies can undertake so that homeowners can receive a warranted discount for this feature on their homes. 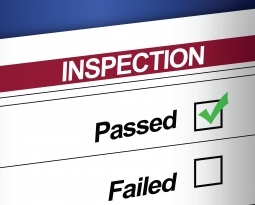 Make sure that when you are quoting for this type of work, they agree to let you use a 3rd party insurance inspection company to perform the subsequent inspection to prove the remediation meets the insurance industry’s requirements and makes your home eligible for a potential discount. When obtaining a quote for remediation work, you can also discuss the project with your trusted insurance agent to find out the likely annual premium impact of demonstrating that you have corrected a particular issue. You can then weigh the costs and the benefits and decide if you want to move forward. Before making a final payment for any remediation work, we strongly recommend using a reputable windstorm inspection company that can certify via an inspection that the work was done in such a way that the discount, if any, will properly apply to their homeowner’s policy. If the retrofitting work fails to result in the appropriate answer for the roof-to-wall connection question, you do not want to be in a position where the company that has performed the remediation has already been paid. If you ever are contemplating such work and would like to be sure that the result of the work is likely to produce the desired effect with respect to your windstorm insurance policy, feel free to contact DMI or any other reputable insurance inspection specialist prior to engaging a remediation construction professional. We would be happy to answer any questions you might have.